Published for the catalogue June 2007 - The Air Gallery, London. The paintings in this exhibition represent an overview of Adrian’s engagement with the subject that has absorbed him for over 25 years. He has always been fascinated by landscape as an enormous ethereal monument whose essence and history defines the image. In his view, the physicality of landscape shapes nature, informs the way we live and triggers memory and debate. Adrian has travelled the world; to Mexico and the Mayan temples; Australia with the searing heat and red earth; Greece with its seductive beauty; the West coast of the USA and its canyons; the disgorged veldt of South Africa as well as the romantic rolling hills of Italy. He returns to his studio to tackle the vast seas, deserts, mountains and plains of his experience. Though he remains in awe of these sometimes remote and hostile environments, he expects to be able to hold his own within his painting. He isn’t frightened or bullied by the enormity of the subject and confronts the challenge of placing the substance of his travels on to canvas. Adrian’s early interest in landscape - as used as a way to inform his painting - was first triggered (in the 1970's) by a discussion with Dr Peter Smith of the Open University about the implications of Plate Tectonics. The theory was still in its infancy and not yet on the school curriculum. The idea that the forces that shape the visual world were then just theoretical constructs was totally fascinating and, for Adian, this concept was at its most acute in the context of the vast geography of travel. He had discovered the purpose for his work and has travelled to explore the relationship between landscape, physicality and memory ever since. Adrian’s painting isn’t about topography or the conventional landscape; it’s about the direct relationship between human presence and nature. 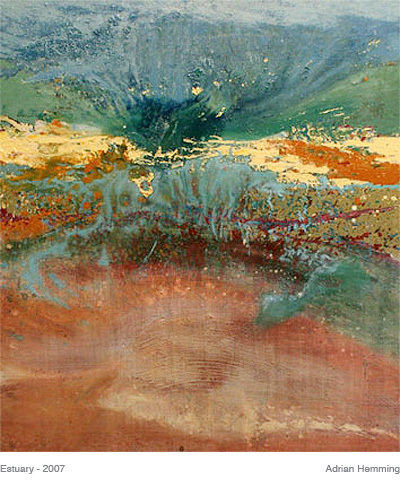 His work hovers somewhere between abstraction & reality (though some of the early work such as the plate tectonic pictures are completely non- representational) and it is within this sense of palimpsest that he is most free to explore the memories that resonate through colour, light and form.